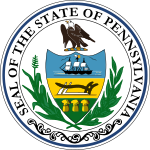 The 1988 United States presidential election in Pennsylvania took place on November 8, 1988, and was part of the 1988 United States presidential election. Voters chose 25 representatives, or electors to the Electoral College, who voted for president and vice president. 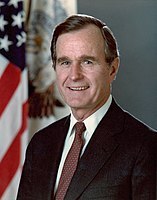 Pennsylvania voted for the Republican nominee, Vice President George H. W. Bush, over the Democratic nominee, Massachusetts governor Michael Dukakis. Bush won the state by a narrow margin of 2.31 percentage points. This was the last election where Pennsylvania would be carried by a Republican presidential candidate until 2016. Northampton and Luzerne counties, both statewide bellwethers, would also not vote Republican again until 2016. This was also the first election since 1932 where Pennsylvania did not vote the same as neighboring New York, another phenomenon that would not occur again until 2016. As of the 2016 presidential election[update], this is the last election in which Philadelphia’s suburban counties, namely Bucks, Montgomery, and Delaware, voted for a Republican presidential candidate. This is also the last time Lehigh County voted Republican at the presidential level. ^ David Leip. "1988 Presidential General Election Results – Pennsylvania". Dave Leip’s U.S. Election Atlas. Retrieved 2018-03-23.